1. Using a fork, mix the eggs, milk, cream and butter together in a heatproof bowl. Season with salt and stir to combine. 2. Place the bowl over a pan of simmering water and allow to cook really slowly using a spatula to continuously stir the mixture. Cook until the eggs begin to scramble – this should take 15–20 minutes. 3. 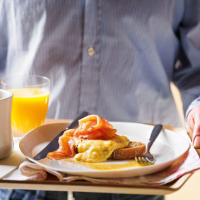 To serve, place the scrambled egg on your favourite toast, top with Heston’s Tea Smoked Salmon then season with the acidulated beurre noisette (see tip). Brown butter, also known as beurre noisette, offers a great way to introduce richness and a lovely nutty flavour to all sorts of recipes. To make it, melt 100g unsalted butter in a medium pan over a gentle heat, whisking continuously, until the solids turn golden brown and give off a nutty aroma. Immediately take the pan off the heat and strain the butter through a coffee filter. For the acidulated brown butter, mix together 100g of the beurre noisette with 30g of sherry vinegar, until combined. Store in the fridge. This recipe was first published in Tue Mar 18 12:42:00 GMT 2014.